Folks, we are up to our ears in tomatoes. Still. It’s been week after week of a million tomatoes. I did one round of canning and got 7 jars out of it. I think I’m all canned out for the season. It’s just not worth all the work. Unfortunately, that leaves me with about 40 pounds of tomatoes to eat. Every week. I cook with them as much as I can. I bring them to work and try to pawn them off on my coworkers. I lure friends into my home and then won’t let them leave until they take some tomatoes. Is it bad to say that I’m actually kind of sick of tomatoes? Even worse, a lot of the delicious tomato recipes I’m seeing are filled with my most recent nemesis – cheese (insert sobbing here). Fortunately, there are recipes out there that are easily adapted to be cheese-free. This recipe happened to not only use up a decent amount of tomatoes, but I was also able to sneak in a garden zucchini and some of our garden hot peppers as well. Win!! Butterfly each chicken breast by cutting it in half horizontally and season on both sides with salt and pepper. Heat oil in a large pan over medium-high heat. Cook chicken 3 – 4 minutes on each side, or until cooked through and internal temperature reaches 165°F. Remove chicken to a plate and keep warm. Add remaining 1 teaspoon olive oil to pan. Add in lemon zest, lemon juice, and garlic. Cook until fragrant, about 30 seconds. Add in corn, zucchini, green onions, and green chiles. 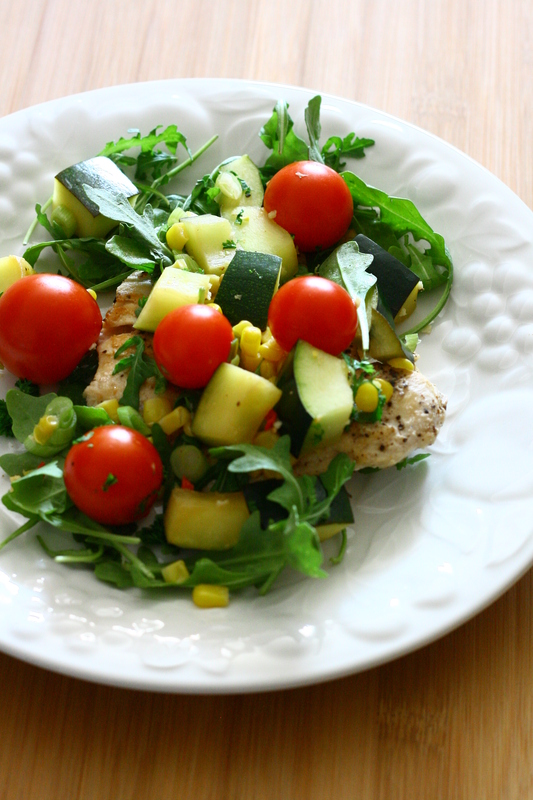 Cook until vegetables are tender-crisp, about 4 – 5 minutes. Stir in tomatoes and parsley and remove pan from heat. 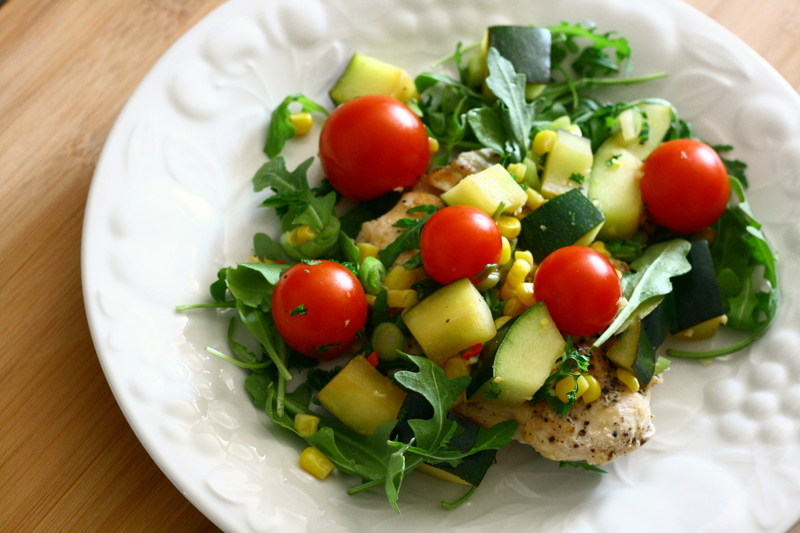 Top each chicken cutlet with a handful of arugula and a healthy scoop of vegetables. Categories: Chicken, Dairy Free, Gluten Free, Main Entrees, Quick & Easy | Tags: chicken, main dish, meat, quick and easy, tomato, vegetables | Permalink.